As with anything you buy, there are fees and costs associated with investment products and services. These fees may seem small, but over time they can have a major impact on your investment portfolio. The following chart shows an investment portfolio with a 4% annual return over 20 years when the investment either has an ongoing fee of 0.25%, 0.50% or 1%. 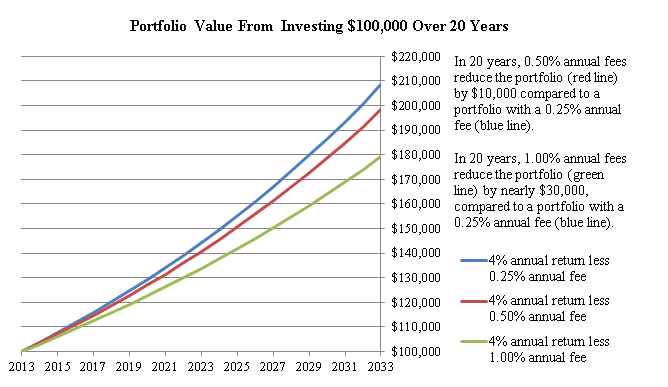 Notice how the fees affect the investment portfolio over 20 years. Along with the other factors you think about when choosing either a financial professional or a particular investment, be sure you understand and compare the fees you’ll be charged. It could save you a lot of money in the long run. How do I know what I’m being charged? Get informed. Find out what you may be charged by reading what your financial professional provides you. For example, look at your account opening documents, account statements, confirmations and any product-specific documents to see the types and amount of fees you are paying. Fees impact your investment, so it’s important you understand them. What are all the fees relating to this account? Do you have a fee schedule that lists all of the fees that will be charged for investments and maintenance of this account? What fees will I pay to purchase, hold and sell this investment? Will those fees appear clearly on my account statement or my confirmation? If those fees don’t appear on my account statement or my confirmation, how will I know about them? How can I reduce or eliminate some of the fees I’ll pay? For example, can I buy the investment directly without paying a financial professional? Can I pay lower fees if I open a different type of account? Do I need to keep a minimum account balance to avoid certain fees? Are there any other transaction or advisory fees? Account transfer, account inactivity, wire transfer fees or any other fees? How do the fees and expenses of the product compare to other products that can help me meet my objectives? How much does the investment have to increase in value before I break even? Check your statements. Review confirmation and account statements to be sure you’re being charged correctly and ask your financial professional to break the fees down for you if it’s unclear. What types of fees are there? Fees typically come in two types—transaction fees and ongoing fees. Transaction fees are charged each time you enter into a transaction, for example, when you buy a stock or mutual fund. In contrast, ongoing fees or expenses are charges you incur regularly, such as an annual account maintenance fee. How do transaction fees affect your investment portfolio? Transaction fees are charged at the time you buy, sell or exchange an investment. As with any fee, transaction fees will reduce the overall amount of your investment portfolio. How do ongoing fees affect your investment portfolio? Ongoing fees can also reduce the value of your investment portfolio. This is particularly true over time, because not only is your investment balance reduced by the fee, but you also lose any return you would have earned on that fee. Over time, even ongoing fees that are small can have a big impact on your investment portfolio. The chart above illustrates the effect of different ongoing fees on a $100,000 investment portfolio with a 4% annual return over 20 years. The chart below illustrates the impact of a 1% ongoing fee on a $100,000 investment portfolio that grows 4% annually over 20 years. As the investment portfolio grows over time, so does the total amount of fees you pay. Because of the fees you pay, you have a smaller amount invested that is earning a return. What is an example of a transaction fee? Commissions. You will likely pay a commission when you buy or sell a stock through a financial professional. The commission compensates the financial professional and his or her firm when it is acting as agent for you in your securities transaction. Markups. When a broker-dealer sells you securities out of its inventory, the broker-dealer acts as a principal in the transaction (that is, selling to you directly the securities it holds). When acting in a principal capacity the broker-dealer generally will be compensated by selling the security to you at a price that is higher than the market price (the difference is called a markup), or by buying the security from you at a price that is lower than the market price (the difference is called a markdown). Sales loads. Some mutual funds charge a fee called a sales load. Sales loads serve a similar purpose to commissions by compensating the financial professional for selling the mutual fund to you. Sales loads can be front-end in that they are assessed at the time you make your investment or back-end in that you are assessed the charge if you sell the mutual fund usually within a specified timeframe. Surrender charges. Early withdrawal from a variable annuity investment (typically within six to eight years, but sometimes as long as 10 years) will usually result in a surrender charge. This charge compensates your financial professional for selling the variable annuity to you. Generally, the surrender charge is a percentage of the amount withdrawn, and declines gradually over a period of several years. What is an example of an ongoing fee? Investment advisory fees. If you use an investment adviser to manage your investment portfolio, your adviser may charge you an ongoing annual fee based on the value of your portfolio. Annual operating expenses. Mutual funds and exchange-traded funds, or ETFs, are essentially investment products created and managed by investment professionals. The management and marketing of these investment products result in expenses and costs that are often passed on to you—the investor—in the form of fees deducted from the fund’s assets. These annual ongoing fees can include management fees, 12b-1 or distribution (and/or service) fees, and other expenses. These fees are often identified as a percentage of the fund’s assets—the fund’s expense ratio (identified in the fund’s prospectus as the total annual fund operating expenses). 401(k) fees. The expenses for operating and administering 401(k) plans may be passed along to its participants. This is in addition to the annual operating expenses of the mutual fund investments that you may hold in your plan. 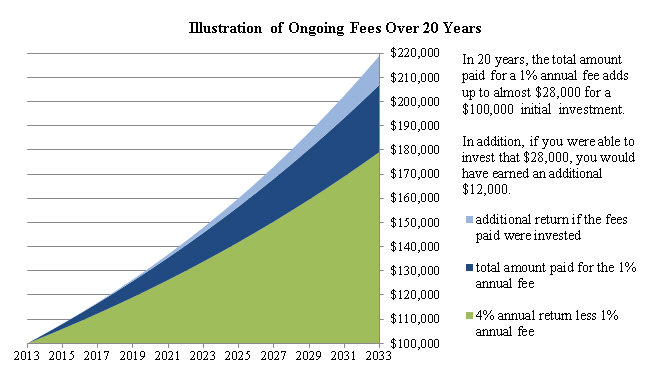 Annual variable annuity fees. If you invest in a variable annuity, you may be charged fees to cover the expenses of administering the variable annuity. You also may pay fees such as insurance fees and fees for optional features (often called riders). You will also be subject to the annual operating expenses of any mutual funds or other investments that the variable annuity holds. What are some examples of products with combined transaction and ongoing fees? Some investment products or services, including mutual funds, ETFs and variable annuities, commonly include both transaction and ongoing fees as part of the structure of the product or service. For example, an ETF is bought and sold like stock, so you may be charged a commission when you use a financial professional to purchase an ETF. An ETF also typically has ongoing fees in the form of its expense ratio, referred to in the ETF’s prospectus as the total annual fund operating expenses. You can use the Financial Industry Regulatory Authority, Inc. (FINRA)’s Fund Analyzer to compare the cost of various types of securities, including mutual funds and ETFs. What other fees might I pay? In addition to commissions, a broker-dealer may also charge certain additional fees such as fees for not maintaining a minimum balance, account maintenance, account transfer, account inactivity, wire transfer or other fees. These fees may not always be obvious to you from your account statement or confirmation statement. You should obtain information about all the fees you are charged and why they are charged. Ask your broker-dealer to explain the fees if you do not understand them. In SEC v. Kingdom Legacy General Partner, the defendants allegedly represented to investors that the investment manager charged an asset management fee of 2% per year and the fund manager charged an incentive allocation fee of 20% of all trading profits in three share classes. According to the SEC’s complaint, the defendants charged additional undisclosed fees of 40% of the trading profits in one share class and 50% of the trading profits in the other two share classes. The SEC recently settled three cases involving transaction costs paid by wrap fee account advisory clients. The SEC announced charges against RiverFront Investment Group, Robert W. Baird & Co., and Raymond James & Associates, Inc. related to the practice of “trading away” (using a broker other than the sponsoring broker to execute trades in which a commission is charged, in addition to the wrap fee, to the client) in wrap fee accounts (accounts where a single fee typically covers all of the management, brokerage and administrative expenses for the account). The SEC charged RiverFront Investment Group, a sub-adviser to investors in multiple wrap fee programs, with failing to make accurate disclosures to its clients in wrap fee programs it managed about how much it utilized the practice of trading away in those programs. In addition, the SEC charged Robert W. Baird & Co., Inc. and Raymond James & Associates, Inc. with failing to adopt and implement adequate policies and procedures to track and provide information to their wrap fee clients and financial advisors about the amount of trading away costs charged to the clients. Without this information, the firms’ financial advisors could not separately consider the costs of trading away in determining whether the use of these programs and sub-advisers was, and continued to be, suitable for clients. What can I do if I think my fees are too high? Follow up. If your fees seem too high, ask questions. Consider following up in writing if you are not satisfied. Negotiate. In some cases, fees are negotiable, so you can talk to your financial professional about reducing them. Shop around before you invest. Just like shopping around for the best price on any other product or service, you should consider how much you are paying for investing services. However, to the extent you decide to move to a new firm, you should think about any tax consequences and fees for closing or transferring your account, for example, if you have to sell some or all of your current holdings in order to transfer. Check the background and registration status of anyone recommending or selling an investment by using the SEC’s Investment Adviser Public Disclosure (IAPD) database, which is available on Investor.gov. If you feel the fees charged to you are excessive, report your concern to the SEC, FINRA, or the North American Securities Administrators Association (NASAA). Use the SEC’s Investment Adviser Public Disclosure (IAPD) database, which is available on Investor.gov, to check the registration status of anyone recommending or selling an investment.